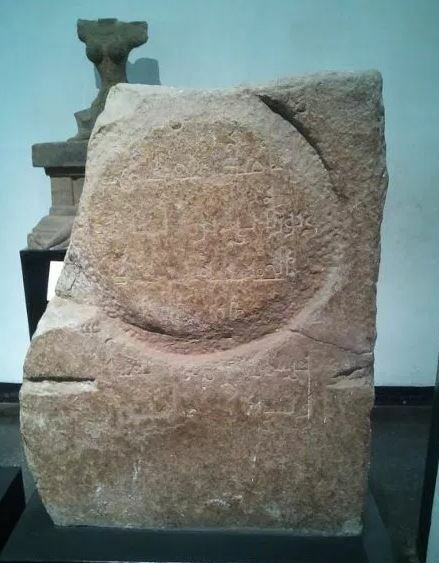 Here are details and photos of ancient Muslim stone inscriptions found in Sri Lanka. Two of them are over 1,100-years-old. 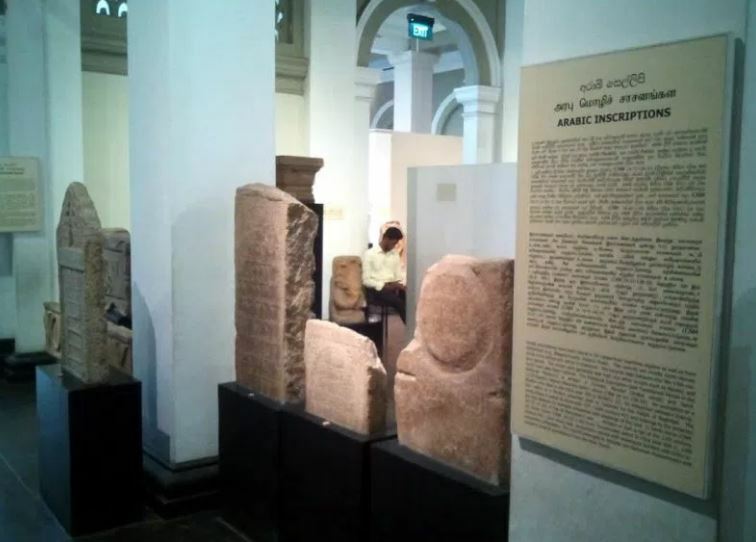 These stones inscriptions are currently on display at the Sri Lanka National Museum in Colombo 7. Muslim stone inscriptions have been found in Sri Lanka from the coastal regions as well as from the interior of the country (e.g.Bhagava-lena cave, Adam’s Peak.) The records are mostly tomb-stones, while some others are votive in character. The records date between the 9th-15 century period. The script used generally was Kufi Arabic style. But other scripts such as Naskhi, and Farisi have also been noticed. Puliyantin Island (Manner) tomb-stone. 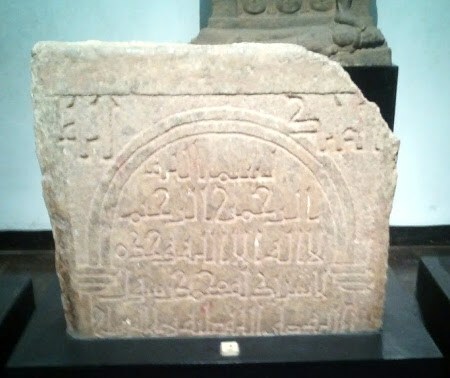 An inscriptions of a Muslim who died in the Hijra year 300 (900AD). For more details see, Mannar Puliyantivu Arabic Inscription Stone . Sir Alexander Johnston Inscription refers to a Muslim preacher sent to Colombo by the Caliph of Bagdad. The tomb-stone is dated to Hijra year 337 (948 AD) and belongs to the preacher In Abu Bakasa (or Nakasa) showered with blessings of the God. SriLankaMuslims.org Note: Colombo Museum says this is the inscription found by Sir Alexander Johnston but we have some concerns. We think it doesn’t match the copy of the stone inscription made by Sir Alexander Johnston in 1827. 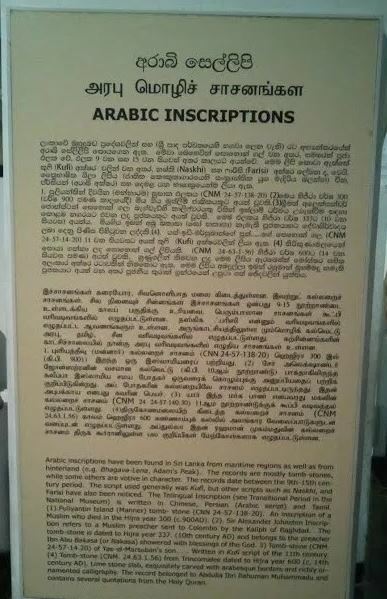 This is the oldest physical evidence we have for Muslims in Colombo and the second oldest for Muslims in Sri Lanka. It is a very important link in our history. Is this really the stone found in Colombo Muslim cemetery? If not where is it? Read more about Sir Alexander Johnston’s stone inscription in, 1100-year-old Colombo Muslim Stone Inscription and Kufic Inscription Found in Ceylon by Sir Alexander Johnston. Tomb-stone of Yas-id-Marsuban’s son… Written in Kufi script of the 11th century. 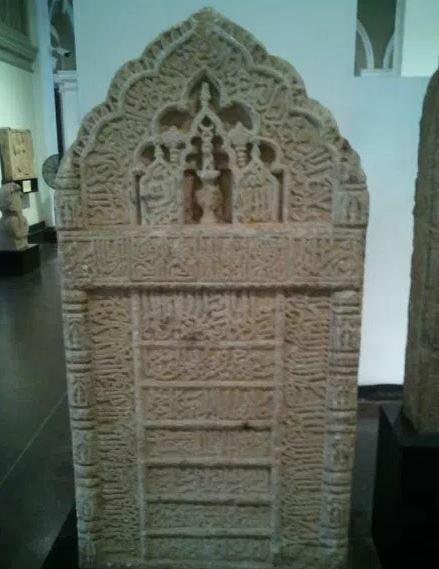 Tomb-stone from Trincomalee dated to Hijra year 600 (14th century AD). Lime stone slab, exquisitely carved with arabesque borders and richly ornamented calligraphy. The record belonged to Abdullah Ibn Rahuman Muhammadu and contains several quotations from the Holy Quran. These are of great cultural and historical importance for the Muslims of Sri Lanka. They prove Muslims have lived in Sri Lanka for at least 1100 years! These important discoveries contribute to the sociological, cultural and historical studies of ancient Muslims and Sri Lanka. 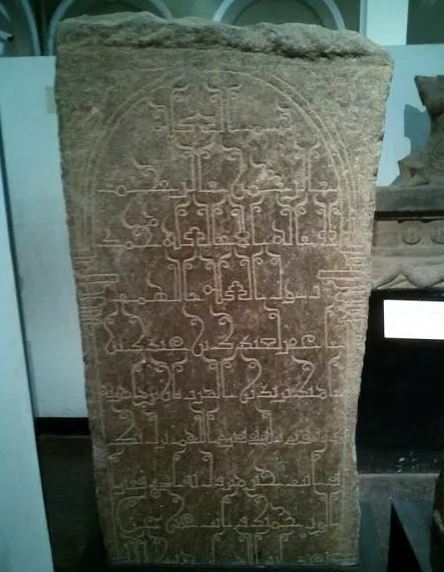 Note: We believe not enough studies have been done on these Muslim stone inscriptions found in Sri Lanka. They are now at the Colombo National Museum, relegated to a little visited corner with hardly any attention given to them. They are lost among the other artifacts in the Colombo museum and not many Muslim visitors even know they exist. We need to need to study, preserve and highlight them to our present and future generations. Where Are These Muslim Stone Inscriptions Now? They are on display at the Sri Lanka National Museum in Colombo 7. You can find them in the, Museum’s “Stone Antiquities Gallery” under the heading of “Arabic Inscriptions”. Here is a plan of the, “Stone Antiquities Gallery” at the Colombo Museum where they can be found. They are labeled as, “Arabic inscriptions” and marked, ‘A’ in this plan. We encourage you to visit the museum and view these very important discoveries of our history. A fragmentary Arabic inscription datable to the 13th century which states ‘… may God Bless him… the Father of Mankind’ has been found in the Bhagava Lena. Bhagva Lena is a cave about 100 feet below the summit of Adam’s Peak mountain. Curiously it is written by the side of an earlier Sinhala inscription of King Nissankamalla granting land to the mountain Shrine. Both these inscriptions indited in the same cave are testimony to the spirit of religious harmony between Buddhist Sinhalese and the Muslims. In 1344, Ibn Batuta on his journeys in Sri Lanka, climbed the mountain. His writing testify to considerable number of Muslims had gone on pilgrimage to Adam’s peak during and prior to his time. According to Ibn Batuta, one of the ten iron chains fixed for ascending the summit was called the ‘chain of the Muslims’. There is mention about two Arabic inscriptions Jailani, Balangoda. One is a inscription reading “Darvesh Mohiyadeen 715”. The number is believed to be the 715 in Islamic Hijra year (1315 AD). The other inscription is dated to be 815 Hijra year (1478 AD). Some sources mention a ancient Muslim inscription was found in Hemmatagama near Mawanella. We are looking for more information about this. This article is a work in progress. It is a community resource and we need your help to improve it. 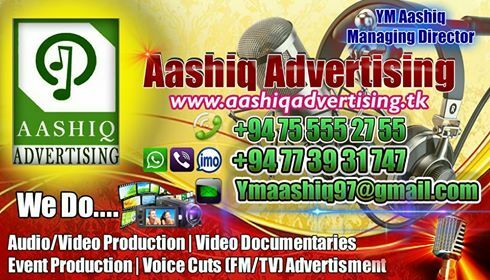 If you have any information, photos, corrections or improvements please email them to: info[at]srilankamuslims.org. We greatly appreciate your support. Thank you.